This needs to be done carefully if you are planning to run the car in coloured gel coat, if you're going for paint you don't need to be quite so careful as the painted will be preping the body anyway. 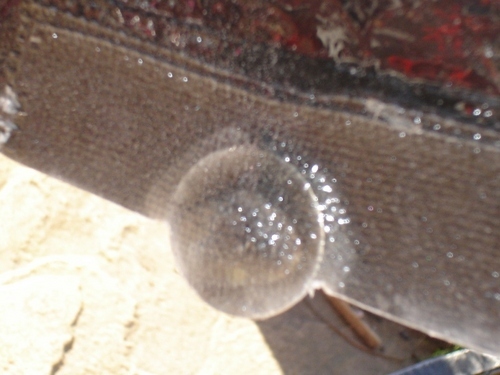 When the body comes out the mould the seams leave a thin, sharp ridge of resin, called a flashline. You need to remove these and made the body perfectly smooth. The famous video shows a vet doing this with a razor blade…..this is ok, but after a short time you'll have very sore fingers and wrists. An easier way is to use something with a handle. I used a decorators scaper/pallet knife that had been sharpened to for a blade, this was far easier to hold and control. With this you run it lengthways down the flashline (wear goggles as bits go everywhere), eventually all the proud bits will be gone and you can then scrap until you have blended the area smooth. In some places you might find one side of the line is higher than the other. This can again be blended in with the scaper. Once you have the area smooth, start with a medium wet'n'dry paper, such as 1200 or even 1000 and LOTS of water. I used firm foam sanding block and in the other hand a sprayer like you get in garden centres, the area must be running with water all the time. Then work up through the grades of paper until you get to 2000, this is very fine and will leave a dull finish, but you should not see any scratch marks. Once this is done you can get the polisher out…. The Pilgrim gel coat is good enough quality to run the car with just a polished gel coat finish and still have a show winning car. This can save you vast amounts of time and money over a paint job, and if you are set on a paint finish, a decent gel coat finish allows you to run the car in gel coat for a while before painting. To get a really good finish on the gel coat is very simple, if a little time consuming. First you'll need to remove the flashlines as detailed above, once they've gone, use wet'n'dry paper to sand down the bodywork. Wet and dry paper is available from most motor factors, Halfords even stock a fairly good range. You want to avoid anything too course and ideally use the finnest you can to remove any marks left from the flashline removal. A rough guide (pun intended) is to start with 1200 grade paper. Work through the papers and end with 2000. 2000 grade paper is very fine indeed but working down to this paper will save you a lot of polishing effort. When using this paper, alway use a sanding block, this will avoid creases in the paper from scratching the bodywork. Soft sanding blocks work well, such as a dense foam. Use lots of water when sanding, get a sprayer like you use to water plants to constantly add water while sanding. Once block and hand sanded, you can go further by a machine polish. Various types of machine polisher are available, with the better pro type machines looking like a 9 inch angle grinder in design. Do not try to use a grinder with pad for this job! Dedicated machine polishers typically run at the recommended speed for polishing (circa 1000-1500rpm) and have a variable speed control. Different foam mop pads can be sourced from various outlets (Machine Mart have a good selection) and spin on to the machines M14 thread. Electric polishers do the job well but do generate heat on the surface, therefore you need to keep the pad damped down when in use. This is more important on gelcoat than a standard metal car body. Polishing compounds are available everywhere (such as Farecla) which are applied to the work and then the polisher does its thing. Because of the damped down pad and the polish and a rotary spinning pad, don't wear your best clothes as it tends to spin off the surface onto you and the surrounding area. With practice, you get to know the right quantities to minimise that. The machine polisher does a great job of and with the correct grade of compound and mop type, the finish polishes up really well. 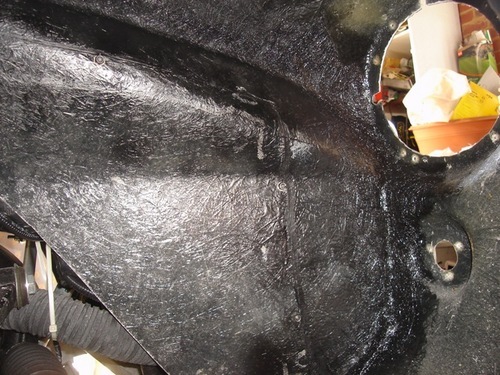 Boat equipment suppliers are a good source for this type of gear, as GRP boat hulls are finished in this way so they usually have compounds and pads in stock. 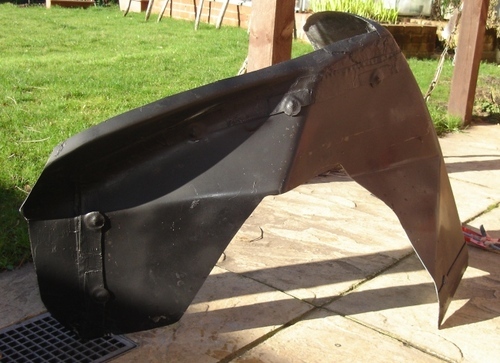 The front inner wings come as single pre shaped panels, they fit inside the front wings and prevent spray from water and dirt from the road entering into the engine bay. When fitted they restrict access to the front suspension, exhaust headers, wiring etc so may builders choose not to fit them until after the car is through SVA, on the road and been set up well. Another option is to modify the inner wings to allow them to be easily removable, this gives you the benefits without the draw backs. Below is some info on how to modify and fit removable inner wings but the principles are much the same if you don't want to make them removable. The first thing to do is jack the car up, remove the wheel, remove the headlight and indicator and try and get the panel in. Chances are it will go in but be a very bad fit, this is fine, they are made oversize as this is obviously better than undersized. 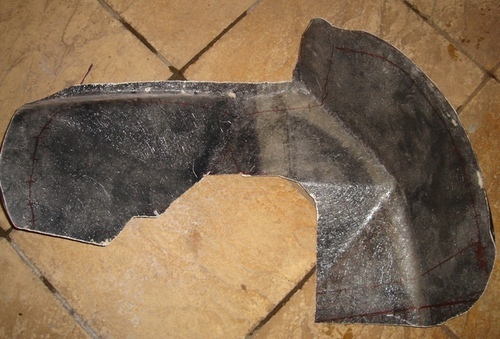 The wings are fitted by fixing it along the large chassis rail at the bottom, to the top chassis rail above the top wishbone fixing point and by fibre-glassing it along the perimeter elsewhere. When you've got it in the rough position, you can start trimming, this should be done in small stages. Offer the panel up, mark a bit to trim with a marker pen, trim it and offer it up again. If you try and trim it all on one go you're likely to cut too much off. 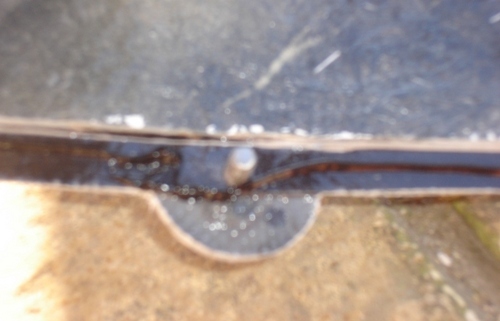 Assuming you are planning to fibreglass the panel in, its not a big problem if the gaps are quite large as fibreglass can easily bridge a gap of 1"+. 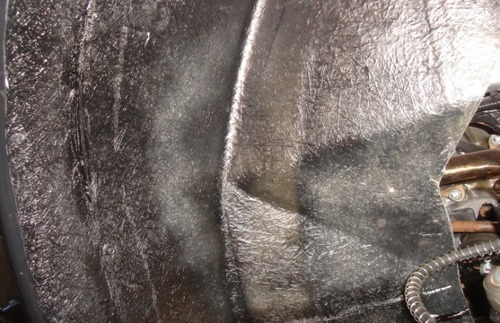 The picture below shows the fit around the headlamp hole, the gap is around 1" and the curved return was removed. 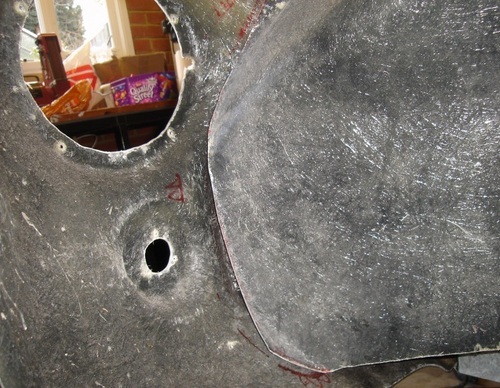 This is the required fit around the arch lip, remember that you need to leave sufficient area of the inside of the arch bodywork to allow the inner wing to be fibre glassed to it, a perfect fit up against the edge of the arch is not good. 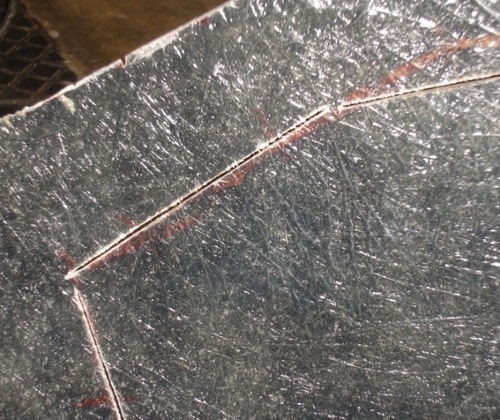 Once trimmed and in place, you can either start fibre glassing and fixing the panel in (more details below on this), or if you are planning to make them removable, you can mark the area of the panel you want to remove. To do this you need to leave all the fixing points to the bodywork intact and just remove the middle of the panel. 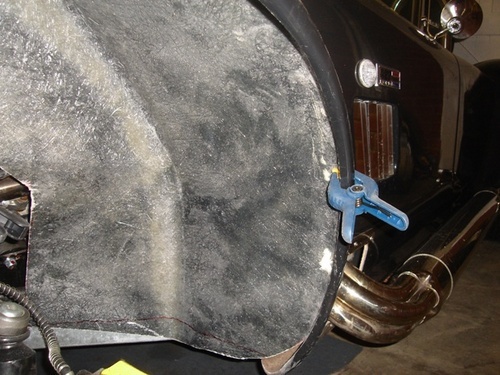 The area where the panel fixes to the chassis can be done with rivnuts to allow them to be bolted or unbolted easily. 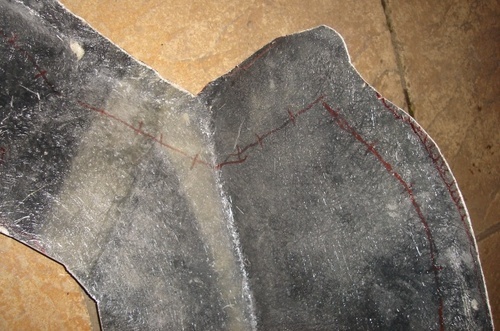 Below shows the marking of the removable panel from the centre. Once you have decided and marked the removable area of the panel, you need to cut it out….BUT….not fully. As you can see above the trick is to cut out all but tiny little bits that hold the 2 pieces together. One common problem is that the front wheels can scrape the bodywork when hard cornering, they tend to catch at the very bottom rear edge of the front arches. This is a significant problem as at the SVA test, they will drive the car on full lock to perform a self centring test, of course any fouling of the bodywork on the tyres is an instant failure. To resolve this is very simple, just round off the bottom edge into a nice curve, this actually looks better too. The red line below shows where to trim.